Philips and Lite-On Digital Solutions (PLDS) introduces its' first external Blu-ray disc reader (BD-ROM) drive to market. 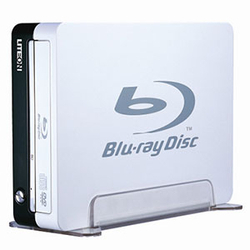 The Lite-On DX-401S allows users to take their BD-ROM everywhere they go to playback high-definition content on different PC's via their USB 2.0 connection. Using a standard USB cable, the consumer can easily connect this new BD-ROM player to almost any computer system providing a convenient way to enjoy Blu-ray disc, DVD, and CD playback on many different PC's. This BD-ROM is able to playback most any optical media including BD-R/RE/ROM - Single-layer or Double-layer media at 4X maximum, Single Layer DVD ±R or DVD-ROM can be read at 12X max, while Double Layer DVD±R and Single Layer DVD±RW can be read at 8X max. CD-R/RW/ROM has a maximum read speed of 32X.